Aaron Quinn (b. 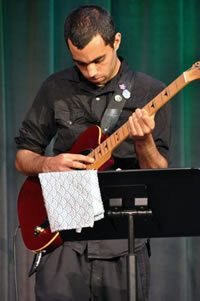 1986 Stamford, CT) is an active guitarist previously based in Columbus and now living in New York City. While attending high school at the acclaimed School for Creative and Performing Arts in Cincinnati, and the Conservatory of Capital University in Columbus, he honed his musical ability with persistent study of iconic figures ranging from Oliver Messiaen to Trent Reznor. While attending Capital University, he studied under Stan Smith (among others), and has been growing as a musician, as well as a person ever since. Aaron’s recent studies have been centered on the chamber music of Toru Takemitsu, Spectralism, Bud Powell, and Balinese ceremonial funeral music of the gamelan ensembles.